Seniors Wes Chamblee and Matt Scheller have been named the North Coast Athletic Conference Men's Sprints/Hurdles and Field Athletes of the Week. Scheller (left) set a new Rose-Hulman Twilight Invitational meet record on Friday evening in the hammer throw with a winning mark of 50.54 meters (165 feet, 10 inches). 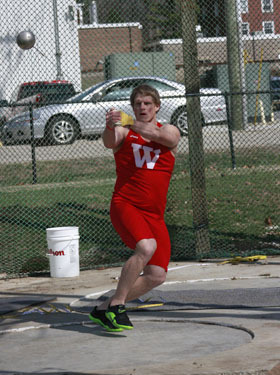 He added another first place finish in the shot put with a mark of 14.41 meters (47 feet, 3.50 inches). Scheller picked up his third top-10 finish by finishing ninth in the javelin throw with a mark of 43.62 meters (143 feet, 1 inch). Chamblee won the 200-meter dash with a time of 22.48 despite racing out of one of the slower heats. He was also part of the Little Giants' second place 1600-meter relay team that posted a season-best time of 3:17.88. Chamblee has been recovering from a knee injury he suffered in the fall while playing football for Wabash.